Great hotel for families with several pools and just on the beach. Let us give you a hand to track down the perfect place to hang out in Mazatlan. We have 56 short and long-stay options within a 10-kilometre distance of Mazatlan. Some of the most centrally located hotels in the downtown area of Mazatlan are the Casa Lucila Hotel Boutique and The Melville Boutique Hotel. A popular neighbourhood to base yourself is Zona Dorada. It's 7 kilometres from the centre of Mazatlan and has 23 places to base yourself. 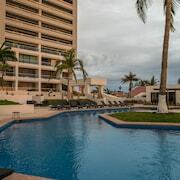 In Zona Dorada, the El Cid El Moro Beach Hotel and Pueblo Bonito Mazatlan - All Inclusive are just a few of the many excellent choices on offer. 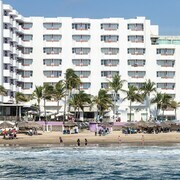 Also popular with travellers is Nuevo Mazatlan, an alternative Mazatlan hotel district 13 kilometres from Mazatlan's centre. 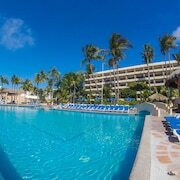 If you are keen on basing yourself here, be sure to check out the Emerald Estates - All Inclusive and Pueblo Bonito Emerald Bay Resort & Spa - All Inclusive. 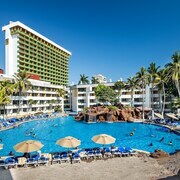 You could check out the Isla Mazatlan Golden Resort or the Residence Club La Jolla. 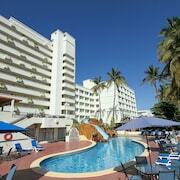 The Isla Mazatlan Golden Resort is positioned 9 kilometres from the heart of Mazatlan. The Residence Club La Jolla is 14 kilometres away. Two more accommodation options include the Royal Villas Resort and the Riu Emerald Bay All Inclusive. 7 kilometres from Mazatlan is Zona Dorada, where you can enjoy the Punta Camaron Beach. Travellers staying in Zona Dorada can pick from the El Cid Castilla Beach Hotel and Costa De Oro Beach Hotel. Alternatively, visitors can stay in Nuevo Mazatlan, 13 kilometres to the northwest of Mazatlan. 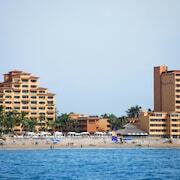 In Nuevo Mazatlan, be sure to check out the Cerritos Beach. The Costa Bonita Condominium & Beach Resort and Torrenza Boutique Resorts are comfortable places to lay your head. 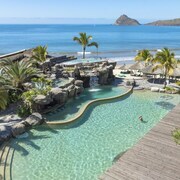 lastminute.co.nz can take you to Mazatlan, on time, on budget and in style. So grab your bag and start packing today.